Part of the emergency measures to respond to Detroit's bankruptcy, over 46,000 shut-off notices were issued in May 2014, with over 17,000 homes having their water supply halted between May and July. The shut-offs have been framed as a necessary measure to deal with a water and sewage system that is no longer financially viable, as “delinquent” customer accounts mean there just aren't the funds to maintain the city's vast but outdated water and sewage infrastructure. Considerable federal subsidies helped to build the infrastructure during the population boom during the 1920s – 50s, now the Detroit Water and Sewage Department (DWSD) has been presented as yet another expensive public service that Detroit, with its shrinking tax base and high levels of unemployment, needs to restructure as a matter of urgency. 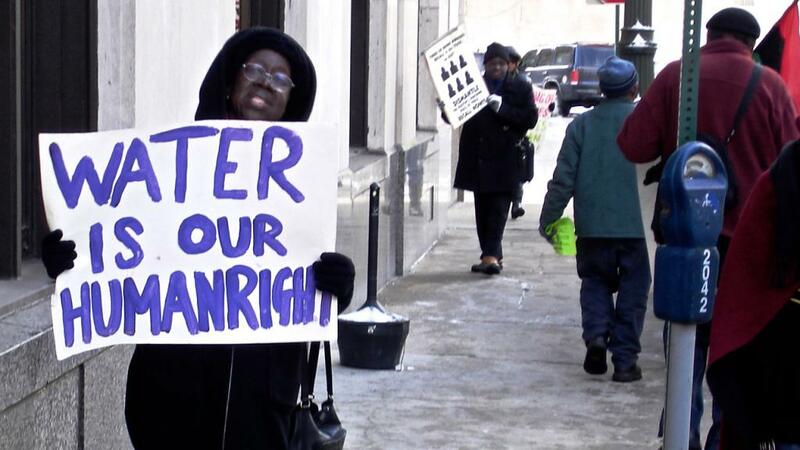 As the water shut-offs hit home after home in the Spring, they were met with protests from local residents, and everyone from local activists to the UN criticised the handling of the situation by Detroit Emergency Manager Kevyn Orr. Orr was appointed without election in May 2013 and given extraordinary powers over the city's financial affairs for an 18-month term, bypassing all pretensions of democratic principles, a move publicly justified due to the seemingly dire straits Detroit found itself in, that the elected officials were seen as incapable of handling. Orr immediately declared the DWSD a priority, but his heavy-handed approach has drawn so much criticism that he has since handed responsibility for the DWSD back to Mayor Duggan. At the start of July, Mayor Duggan's attempts to clean up the PR disaster brought about by the shut-offs started with a 10-point plan he says will stem the pace of shut-offs across the city. His plan focusses on encouraging customers to set up payment plans, and includes increasing the opening hours and staffing levels of DWSD call-centres, waiving further penalties for those who set up payment plans, and giving households notice of one week before their water is shut off. Duggan has also championed charitable efforts to raise funds towards the bills of Detroit's poorest residents. These actions all respond directly to criticisms levelled against Orr's handling of the situation, and the month-long moratorium was intended to provide residents a chance to take advantage of the new plan and begin to settle their bills. Duggan has stated that should he have been given responsibility for the DWSD last year, this plan would have been implemented before the shut-offs. Mayor Duggan good cop. EM Kevyn Orr bad cop. Missing from Duggan's plan is any attempt to address the structural problems at play. Despite being on the Great Lakes, which represent 95% of North America's surface fresh water, water costs on Detroit are nearly 50% higher than the national average, and Detroit residents have seen the cost of water rise 119% over the last decade. Duggan's payment plans do nothing to address the cost of water in Detroit. This week, the shut-offs started again for Detroit residents who have not signed up to payment plans during last month's moratorium, and it is likely that public sympathy for those affected will wane. The moratorium ultimately acts to legitimise the shut-offs and strengthen the notion that those households without water are not victim to wider structural inequalities and harsh austerity measures, they're just financially irresponsible customers who choose not to pay their bills, even when the Mayor bends over backwards to give them a second chance. At 84%, Detroit has the highest population of Black residents of any city in the US. In 2011, nearly 20% residents lived below the poverty line, and one in three children lived with single mothers. It should come as no surprise then that the financial behaviours of Detroit's residents come under intensive scrutiny, and that the blame for poverty is placed largely on the poor. Detroit's population is easily vilified, and the return of nice guy Mayor Duggan will now allow shut-offs to continue apace without looking quite so draconian. The residents have been given ample opportunity to settle up, after all. The DWSD have made no secret that the shut-offs are intended to discipline their customer base, and have taken advantage of the vilification of their customers as feckless and irresponsible. Daryll Latimer, the department's deputy director, argues that “not everyone is in the situation where they can’t afford to pay [...] it’s just that the utility bill is the last bill people choose to pay because there isn’t any threat of being out of service.” The shut-offs are a rational attempt to “shift the behavioural payment patterns of our customer base”, according to another DWSD official. The behavioural payment patterns of DWSD's commercial customers have not been criticised by officials1. Vargo Golf owes over $500,000. Other corporate customers with significant debt include Ford Field, Detroit Lions, and the State of Michigan. Whilst some shut-off notices have recently been issued to corporate customers, these are pretty much window dressing, with Latimer himself admitting these customers have not been pursued and claiming that it was too technically difficult to shut off water to major corporate accounts. Excuse me sir, is this your debt? The DWSD serves a far broader area than just the city of Detroit, with over 4 million customers. Detroit has a population of just over 700,000. The DWSD's cash flow problems are being effectively blamed on a fraction of their overall customer base, and it is the residents of Detroit who are being punished for a problem they didn't cause. And whilst it's true that the DWSD has debt of $5.8 billion, there is no evidence that the department was even close to insolvency at the time EM Kevyn Orr filed for bankruptcy. In fact, the City was not even liable for DWSD's debt, yet Orr was keen to pull the extra $5.8 billion into insolvency proceedings, inflating the overall figure for Detroit's debt to $18 billion, making a much more convincing case for bankruptcy 2. The bankruptcy proceedings serve to justify not just Orr's own appointment as EM, but a wider range of drastic financial restructuring which can be rushed through without the usual red tape of City bureaucracy. The management of the system would be transferred to a new board that would include appointees by the governor and would effectively come under his influence. The new board would consider privatization of large elements of the system and the system’s work force would be beaten down by salary and benefit cuts. The governor and legislature would score a victory over the public employee unions by damaging their members. And just think of all the useful relationships that the governor could develop if he could influence the award of huge privatization contracts. This would, of course, be good for the governor’s party in state-wide elections, not to mention its prospects in the national elections of 2016. It might just serve wider political interests if it were to alter the critical debates over the Midwest watershed as fracking and oil and gas transmission from Canada confront environmental issues3. Detroit residents have not taken the shut-offs lying down. 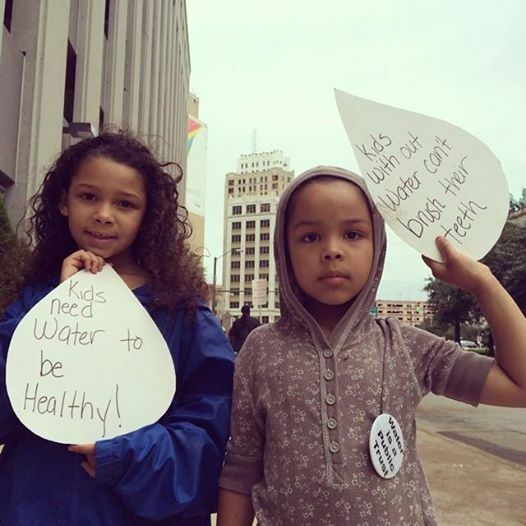 Large street protests caught the headlines before the moratorium, efforts to crowdsource money for residents' bills had some success, and convoys of water were driven into town from Canada to relieve those whose water had been cut off. The newly formed Detroit Water Brigade issued advice on how to turn your water back on and prevent further shut offs. Protests and blockades of shut-off teams forced the DWSD to remove the “water shut-off” signs from their vehicles. And whilst many have responded positively to Duggan's 10-point plan, it will be interesting to see how levels of resistance continue in this new round of shut offs, now Duggan has smoothed over the worst excesses of Orr's approach. As Orr, Duggan and other officials, elected or not, discuss the finer points of restructuring the DWSD, there are still thousands of households without water. Without the means to flush a toilet, make up formula milk, boil a kettle. Predominantly Black and Latino households, in a city whose public services have been stripped systematically following industrial collapse, households who are easily painted as responsible for their own misfortunes, whilst it's business as usual on the golf course. 2. There is further evidence that the frequently reported debt, notwithstanding the $5.8b from the DWSD, has itself been inflated in order to attack the benefits of public sector employees, and you can read more about that here http://www.demos.org/publication/detroit-bankruptcy. The DWSD have made no secret that the shut-offs are intended to discipline their customer base, and have taken advantage of the vilification of their customers as feckless and irresponsible. Excellent article, thanks for researching it and writing it up! But one thing which is interesting is seeing that water provision in Detroit is still a public service. Especially as in the US privatisation is usually more widespread than in Europe, and here in the UK all the water companies were privatised years ago. In England and Wales water provision has been by private companies (quickly googling it I see that in Scotland and Northern Ireland it is still publicly owned, which I didn't realise) since privatisation in 1989. A big few essentially have a monopoly. However water disconnections for domestic users are illegal here, and have been since 1999. So before the privatizations they were owned by the English and Welsh governments. Here it's local government that runs it. Which would make it easier for any specific water department to avoid privatization. There's millions of individual town, city and county water systems. Yes, that's right. In the UK it wasn't quite that straightforward, but the entire system was owned and run by just 10 regional water boards, and those were sold off.